Istanbul is so full of history. It's old. Really, really old. And if you go, you can't miss seeing the Hagia Sophia or the Blue Mosque. Situated just across from one another - they are two of the most beautifully built mosques I have ever seen. The date of the dedication of the Hagia Sophia was 360. Walking around inside is like stepping back in time... it's hard to believe how many people have walked on those stones, seen the interior, and visited. I felt overwhelmed. We did a walking tour with headsets and spent time wandering around. 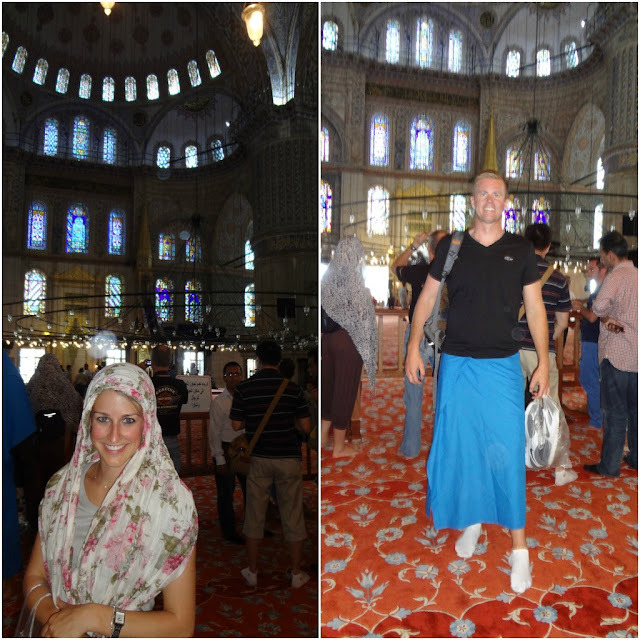 After some time inside the Hagia Sophia, we walked across the courtyard area and over to the famous Blue Mosque. 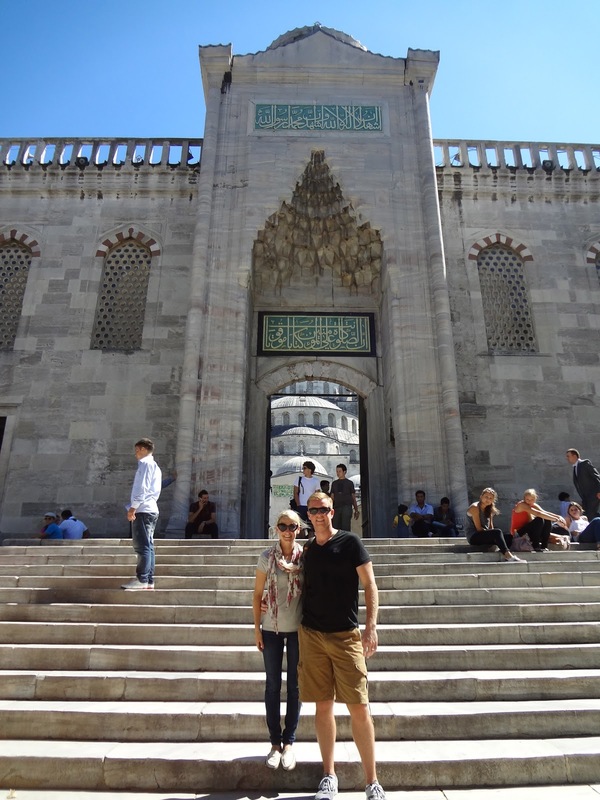 The Blue Mosque is one of the most well-known Mosques in the world. When you go, make sure don't go during prayer time. The entrance is also to the back. We were lucky to get in line quickly and made it in with out a wait. They cover you up and ask you to respect their culture by covering your head and shoulders - and TL had to wear something to cover his legs. We spent a while in there just in disbelief that we were there. We learned so much, and the interior of both of these places is truly amazing. It was an incredible experience, and one I will certainly never forget!! Some of the paint is wearing away... not shocking for how old it is! There was a painting of the Virgin Mary and Jesus from the 9th Century... crazy! They don't have stairs... they have winding hallways to take you to the second floor of the Hagia Sophia. It's amazing to think of the millions and millions of people who have walked these halls. On the second floor admiring the views of the entire Hagia Sophia. What an incredible day seeing both of these beautiful places. We'll never forget the experience of seeing them both. While you are there, they do give you a little bit of information, but we also did a little research before we went so we would know what to expect. That is so interesting that you had to have legs covered but bare feet! What beautiful pictures and it looks like a truly beautiful city! Love the pictures of Hagia Sophia! So beautiful. The architecture is just stunning. Wow! So beautiful and so amazing that they figured out how to build them so many years ago. Oh wow, what an experience! That must have been so neat to see in person! just amazing! 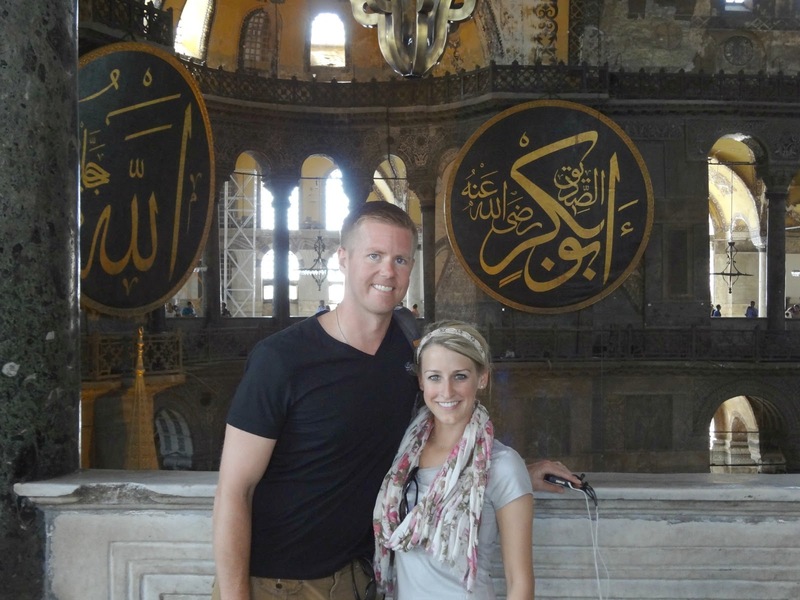 Nick took an architecture class in college and said they spent a full day just on Istanbul! gah you're making me regret not going to Istanbul! We went to Ephesus instead which was great but man you're pictures are really making a case for Istanbul. Just lovely!! The sky looked pretty as well that day! İstanbul is one of the most historical and beautiful cities in the world. The city has been the capital of three great empires, the Roman, Byzantine and Ottoman. Sultanahmet Square is located in the south-eastern of Istanbul and the district where you find the Topkapi Palace, theHagia Sophia and the Blue Mosque, is the heart of tourism in Istanbul. In the Byzantine and Ottoman eras, the religious, cultural, administrative and social centers were all in this district so, tourists come to see historic Old Istanbul’s most prominent buildings and monuments.